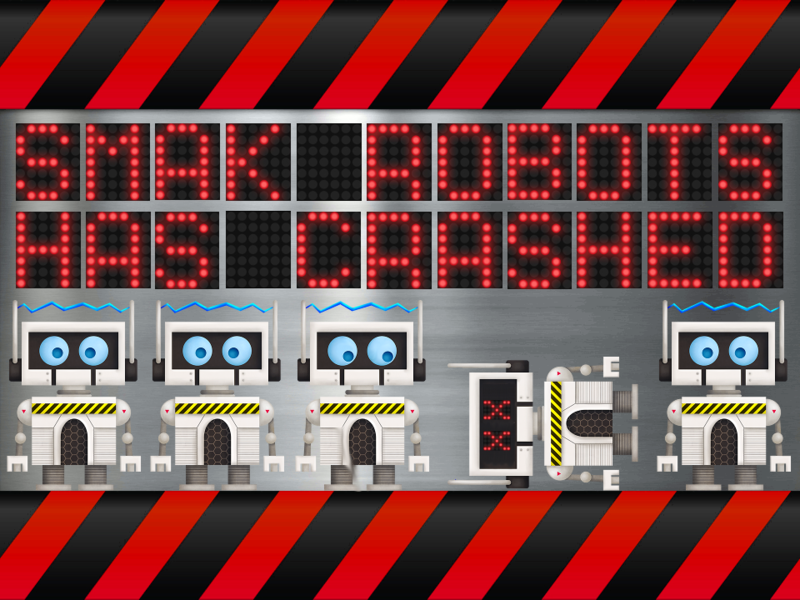 Believe it or not we’ve officially opened up beta testing for our first creation: S.M.A.K. robots. You can read more about the beta test, and how to sign up for it, on our Facebook page here. Comically, on this very site, years ago, I had posted that I thought we might be close to beta testing (at that time) in “just a few short months“. Well, I guess it’s comical in a ‘man that was a ridiculous amount of work and I can’t believe we’ve finally arrived at this point’ sort of way. Then again, considering that I’m tearing up just thinking about the effort that went into the span of time between then and now “comically” probably wasn’t the right word choice… spiraling, spiraling. Think of beta testing as your free labor in exchange for an early chance to play our game that might still be really buggy. You get to be among the first chosen few to encounter crashes, bugs, and bad UI (user interface) design before anyone else! Sounds like a great deal right? Notably, I can think of few other endeavors where you publicly invite others to test your product in hopes that they find really big problems. If we had a QA (quality assurance) guy he’d probably be really nervous at this point in time given the stuff that’s probably still lurking in the game… I’m kidding, of course. Or am I? If beta testing is on your bucket list then here’s your chance. Or, maybe you’re a beta testing pro and you’re looking for a challenge; if so, look no further. All kidding aside, whether you’re a veteran of this sort of thing or a newbie you’re welcome to join and we’d love to have you. We’re looking for feedback on the game, all aspects of it, and not just if, when, and how often it crashes. There are a limited number of testing spots available so if you’re interested in signing up pop on over to the link at the top of this post. I’ll leave you with the following image, which is one of my absolute favorites from the game. It probably shouldn’t be considering it only shows up when we detect an error but I can’t help but love the angst from the robot in the middle that’s conveyed through nothing more than the angle of his eyes. Plus, I secretly hope you NEVER encounter this screen from our app and in an effort to feed my ego a bit I’d like to think that I’m showing this to you here now because you’d otherwise never be able to enjoy it. If you are able, and it works out, we’re hoping you get a chance to participate in the beta. Next Post: Coming Soon: Earth’s Newest Robotic Overlord!